Why do the costs not go up with prevailing wage? 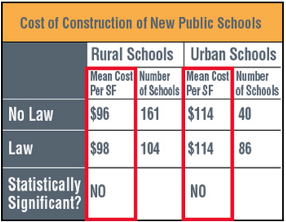 Labor only makes up 21% of total building construction costs in Kentucky. Reducing wages doesn't produce any savings without paying workers illegally below minimum wage. However, productivity does drive the cost of construction. Skilled workers on prevailing wage jobs are 15% more productive than less-skilled workers. Kentucky taxpayers get better project quality and self-sustaining jobs at no additional cost to the taxpayer. Lowering local standards for construction wages attracts a lower skilled, out-of-area workforce which results in large productivity losses, costly errors on the construction project, inefficient use of expensive materials and fewer jobs for Kentuckians. *Kentucky's Prevailing Wage Law, Phillips, P., 2014.